How To Sell Your Stuff!! The first time you REGISTER you will receive a unique consignor number that will give you access to our tagging system. You will receive a series of emails that will walk you through the consigning process. Gather your GENTLY used children's items. Make sure they do not have any rips, tares, holes or stains. Make sure all the pieces are included for games and puzzles. Print your barcoded tags and attach them to your items. Look for our emails with great tips. Join our Hands On Consignor 101 class! For more info click HERE! Join our Consignor Only Facebook Group HERE! Bring your prepared items to Total Turf Experience and we will take it from there! Consignors decide if they want to donate their unsold items at the end of the sale or we will sort them and have them ready at consignor pick up on the final day of the sale! Consignor Checks are mailed 7-10 business days after the event is over. You're on your way to clutter free closets & ca$h in your pockets! Do you have unused or outgrown infant, children, teen or maternity items cluttering up your house? When was the last time your kids used the toys at the bottom of their toy box? Would you like to earn money on these items? Would you like money that you can use for a vacation, kids activities, next seasons wardrobe or Holiday presents? If you answer is YES, then JBF is for you. You prepare the items, drop them off at the sale and then WE do the rest. We ensure thousands of shoppers come to the sale in ONE weekend! The average consignor sells over $300 of stuff! Are you sick of earning 50 cents on items at a yardsale, or wasting your time on no-shows at Craigslist or Buy/Sell meetups? Who has time for that!? 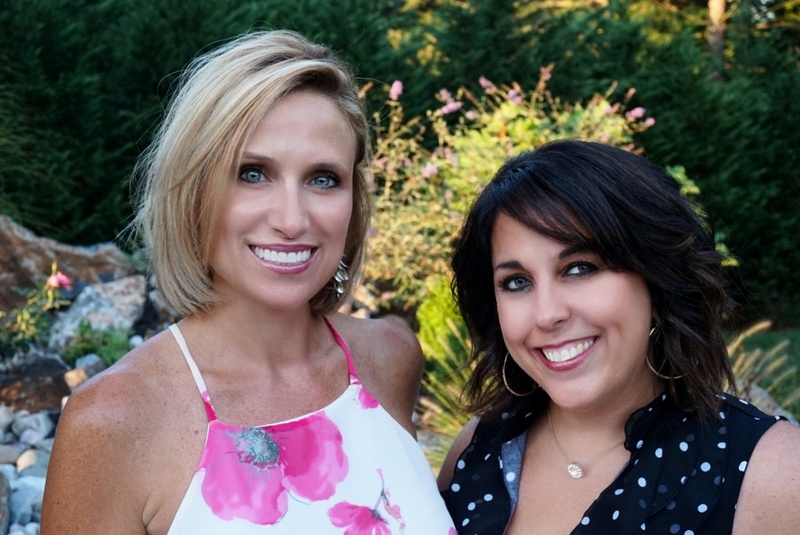 We've been there too, and that's why we decided to bring JBF to Gloucester County! No haggling, no meetups. Just an easy way to earn CASH for your CLUTTER. JBF Western Gloucester County (WGC) Consignors earn an average of over $300 at each sale and you can TOO! A $10 fee is taken out of your check, with no upfront costs to participate. The "how to" VIDEOs (below) walk you through the process. Do you want us to waive your consignor fee? If you mark ALL the items you bring to BOTH REDUCE AND DONATE and have a minimum of 75 items, We will waive your $10 consignor fee to say "Thank You! for giving back! Too busy to tag? Try our Valet Service! We will set you up with your own personal tagger! Join Our Team- Earn More! Volunteer Schedule Opens February 24th!! Shifts are in 4 hour increments. The more shifts you complete, the earlier you get to shop! The earlier you shop, the more merchandise and better bargains to be had! At JBF, we make drop off and pick up super EASY & FAST! Thursday, March 28th 1-8pm (please arrive by 7:30 to allow yourself time to place your items on the floor. Consignors with over 300 items must schedule an appointment Here. Now for the fun part, getting all of this stuff out of your house! 1. Prep, price and organize your items at home (See details below) and bring them to Total Turf Experience to be SOLD! 3. When you arrive, please bring at least one item with a barcode into the building when you arrive so we can scan it to check you in. 4. We will have rolling racks/carts available on a first come first serve basis to help transport your items into the building. You will place all items on the sales floor. Please plan to allow 30-45 Minutes for this process depending on how many items you are selling and how organized they are. 5. You will place all of your items on the sales floor and we will inspect everything AFTER you drop them off! This will save you time! Items that do not pass inspection will be held for you to pick up or automatically donated if marked "donate". 6. Watch your sales LIVE on our online tagging system. It's that easy! Forget something? Couldn't fit something in your car? We accept only big items and toys. WE will NOT accept any more clothing or shoes at this time. If you mark ALL the items you bring to BOTH REDUCE AND DONATE and have a minimum of 75 items, We will waive your $10 consignor fee to say "Thank You!" for giving back! If you are planning on reducing and donating all your items and would like us to waive your consigonor fee, you MUST fill out this form. 4. Watch your sales grow with our real time updates!! Woohoo!! You have a choice! You may donate your unsold items to our charity partner, The Unforgotten Haven OR Pick up your unsold items (or both). By donating your items, you will not only be helping our local community but also receive a tax deduction! Pick up is SIMPLE and EASY. ALL your items are sorted for you!! We ask that you please leave a large tote/storage container with your consignor number written large and clear in permenant marker or taped on securely. Please leave lids at home. We will use these to sort your items and keep them off the floor! You may need to bring an additonal tote/laundry basket/wagon to take home your items. You will be in and out in 10-20 minutes! If you are a Power Consignor (dropping off more than 300 items) and you wish to pick up your unsold items. You are required to help for 1 hour during breakdown or 2 hours during our busiest times. Sign up HERE! Don't worry, you will meet great people and have fun! Tag: Hole-punch JBF tag and attach it to item with a ribbon, string or zip tie. 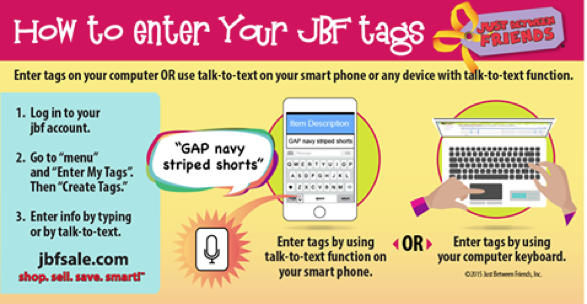 If item contains multiple pieces, be sure all pieces are included and list number of items on JBF tag description. Be selective when selling blankets, receiving blankets, burp cloths, and towels. New and barely used items sell best. Check carefully for stains. Package: We suggest hanging blankets and towels on a hanger. They are easier to see. They may also be placed in a plactic bag, but they sell better when they are hung. If using a large baggie, make sure the bag is taped shut so they items can not fall out or get separated (be sure multiple pieces cannot be separated). Games and puzzles must have all pieces. No "adult" content please or "M" video games, please. We are unable to accept VHS tapes. Check DVDs and video games for scrathes and double check to ensure the disk is in the case! Tag: When tagging books, please attach your tag to the book with clear scotch tape or blue painter's tape that can be removed without damaging the item. Tape tag to the outside cover. Please do not use masking or double sided tape. Hole-punch JBF tag and tie to sets or put sets in a zip lock bag with the JBF tag taped to the outside. Tape bag shut so they don't get separated. Need a visual? Check out this video for additional tips. Package & Hang: Hangers - Please hang clothes so the hanger hook points to the left (like a question mark). We are not picky about hangers- use what you can find!! We will occationally have times when you can pick up supplies/hanger- please watch for our emails and facebook posts for dates and times. Pants/Shorts/Skirts - Pant-clip hangers are great but if you use a standard hanger, simply use your tagging gun to attach pants to the top part of the hanger so the garment will not slide. Onesies, socks, tights, hats and infant mittens need to be in a clear zip-lock bag (you may group multiple items in one bag). Please be sure to label your tag well so that customers know if the items are short-sleeve onesies or long-sleeve onesies. We have a $3 per hanger suggestion at the JBF Western Gloucester County sale. We encourage you to price anything on a hanger for a minumum of $3. You can pair multiplies together, like 2 tshirts or 4 onesies. Don't waste a hanger on a $1 item. Need a visual? Check out this video on how to prep and tag clothing items. Exersaucers, swings, high chairs, changing tables, strollers, bath seats, baby walkers, car seats & car seat accessories must be checked for safety recalls, must have all parts, and be in good condition. Children's furniture including toddler, twin or bunk beds, desks, changing tables, dressers, etc. great. Package: If item has multiple pieces use packaging tape, zip-ties, or string to keep items attached together. If wooden furniture has loose parts, use clear plastic wrap to secure item. All furniture and equipment must be assembled during the sale. Please bring a Car Seat Checklist for any car seats, booster seats, or car seat base that you wish to sell. Heavy Items- We will attach a yellow claim ticket to large items that can not be picked up and carried around. Please don't attach tags to heavy or large items, we will help you do this when you arrive at drop off. Nursing covers & pillows, feeding items, monitors, safety items, diapering & toileting items, rattles, and more. Check for safety recalls on all items that you consign. Heavy items: we will attach a Yellow claim ticket to large items that can not be picked up and carried around. Please do not attach tags to heavy or large items, we will help you do this when you arrive at drop off. Need a visual? Check out this video on how to tag shoes. We accept stuffed toys that are characters (such as Mickey Mouse or Dora), battery operated (like Tickle Me Elmo) or brand new with tag, Pillow pets, Seat pets and Beanie Babies. Please, no generic stuffed animals or Webkinz. Need a visual? Check out this video on how to tag toys with multiple pieces. If you mark ALL the items you bring to BOTH REDUCE AND DONATE and have a minimum of 75 items, We will waive your $10 consignor fee to say "Thank You!" for giving back! You MUST fill out this form In order for your fee to be waived. Do you have more "stuff" than time?? Consider our Valet Tagging Service. ~Consignors receive 45% of their items sales and a pass to shop our exclusive Pre-sales! 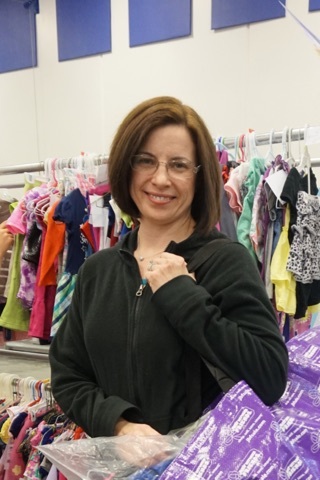 (50% if you Volunteer for a shift) ~Consignor is charged a $20 consignor/supply fee for the 1st 300 clothing items, and $5 for each additional 100 items. ~You must have a minimum of 150 items. ~If clothing is not on hangers, it must be sorted and separated by gender and size or you will be charged a $10 sorting fee. ~All items must be clean and free of stains or excessive wear. Any item that is rejected will be donated to charity. If more than 5 items are rejected you will be charged 20 cents per item. ~Items must be dropped off in boxes that will not be returned. Items in Plastic bags/Trash bags will not be accepted..
You will recieve a presale passes for you and a guest to shop early via email. Your tagger will price, store, bring and place the iems on to the sales floor. After you drop off, just wait for your check to arrive 2 weeks after each event! Tagging is easier when you have all of the supplies at your finger tips. Chances are, you have most of these items somewhere (the question is where) in your home. Hangers- plastic or wire- whatever you can find! Tagging gun- totally optional but will save you time and make tagging much easier especially if you have a lot of clothing items. The cost is $25 and includes shipping. To Place your order, please click HERE to be taken to our secure paypal account. 500 Barbs for tagging kit. The cost of a replacement kit is $15 and includes shipping. Click Here to order. We also host supply pick ups in the weeks leading up to the Event. Please watch for facebook posts to see the dates of these events. Remember to like us on Facebook for updates! Our Team Leads must physically help out at the sale for a minimum of 16-20 hours. Shifts with double credit do not count towards team lead status. Make new friends and have lots of FUN! !